Ernest Orlando Lawrence was born in Canton, South Dakota on August 8, 1901, the son of Carl Gustavus and Gunda Lawrence. His parents were Norwegian immigrants and his father was superintendent of schools. He attended Canton High School and then St. Olaf College in Northfield, Minnesota. In 1919 he went to the University of South Dakota, working his way through college by selling kitchenware. Originally he studied for a medical career but switched to physics. He graduated in 1922 with a B.A. in Chemistry. He then went to the University of Minnesota where he earned an M.A. in physics in 1923. He then went to Yale finishing his Ph.D. in physics in 1925 completing a thesis on photoelectricity. He remained at Yale for three more years as a National Research Fellow and assistant professor. In 1928 he left the relative comfort of his Yale position as an assistant professor to become an associate professor at the University of California Berkley. Two years later he became a full professor at Berkley, being the youngest professor at Berkley. In 1936 became director of the university's radiation laboratory. He remained at these positions until his death. Lawrence's early research dealt with photoelectricity and the ionization potentials of gaseous metals. In 1929 he invented the cyclotron, a device which accelerates atomic particles without using high voltages. Cyclotrons use an alternating voltage to accelerate particles, and a perpendicular magnetic field holds the particles in a circular path so that they can re-encounter the accelerating voltage many times. Thus the particles are gradually sped up by multiple encounters with the accelerating voltage. Cyclotrons, because the accelerated particles move in a circular path, take up less space than linear accelerators. Cyclotrons are used to create non-naturally occurring elements by bombarding atoms with atomic particles to create larger atoms. Cyclotrons have also been used in medicine to bombard cancerous tumors with radioactive particles. During World War II Lawrence worked to help develop the atomic bomb. His radiation laboratory actively took part in the research for the development of the bomb. 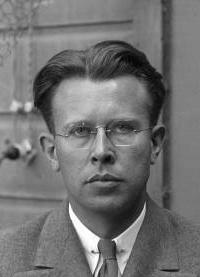 A early proponent of electromagnetic separation of uranium isotopes he developed calutrons, a specialized type of mass spectrometer, to separate the isotopes. He also introduced J. Robert Oppenheimer into what would become the Manhattan Project. In 1939 Lawrence won the Nobel Prize "for the invention and development of the cyclotron and the results obtained with it especially with regard to artificial radioactive elements." Other honors received by Lawrence include the Enrico Fermi Prize awarded by the U.S. Atomic Energy Commission in 1957 and the Sylvanus Thayer Award presented by the United States Military Academy. Element 103 (atomic number 103) is named Lawrencium after Lawrence. In 1958 Lawrence was appointed by President Eisenhower to take part in the negotiations with the Soviet Union over and atomic weapons treaty. Despite suffering from colitis Lawrence decided to go to Geneva, to take part in the negotiations. Falling ill while he was in Geneva Lawrence was rushed back to America for medical treatment. Lawrence died one month later on August 27, 1958.